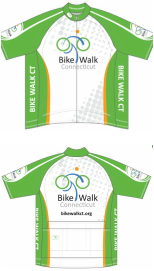 Limited Time Offer - Bike Walk CT Custom Jersey! We are thrilled to have our own jerseys now available for purchase in connection with our 2013 Summit, to be held at Yale on April 27. Our exclusive jersey is designed and produced by SUGOI, a brand that athletes have trusted for years as a manufacturer of hard-working sports apparel. Sizes XS - 2XL. IF IN DOUBT, ORDER UP ONE SIZE!! Please note: All sales are final. Due to the small scale of our partnership with SUGOI, there are no returns or exchanges. Thank you for your understanding. We'll ship to the address you provide.